This season the traditional youth basketball events in France, reserved for U18 preparations, were upgraded to U19 events, so the whole programme for the U18 was modified. A total of 24 players were called up for the U18 team this year. The first training camp which was for five days was held in April. Arnaud Guppillotte used this opportunity to work with Jérôme Fournier, the U19 coach before making decisions which players would prepare for the U18 European Championship or the U19 World Championship. The French Federation had made a decision that any player retained for the U19 team would not play for the U18 or U20 this summer. The second phase of the youth basketball programme started on 22 June in Troyes. The players retained spent three weeks together and played six official games. The roster was reduced before the last set of home international matches against the Netherlands, Poland and Sweden in Aix-en-Provence. The 12 players released along the way were: Viviane Adjutor, Justine Barthelemy, Clarisse Berranger, Nina Deal, Rudiane Eduardo, Axelle Koundouno, Samira Leandre, Laure Mercier, Caroline Misset, Caroline Plust, Onayssa Sbahi and Awa Sissoko. The 12 players selected left France on 22 July for a preparation tournament in Turkey. 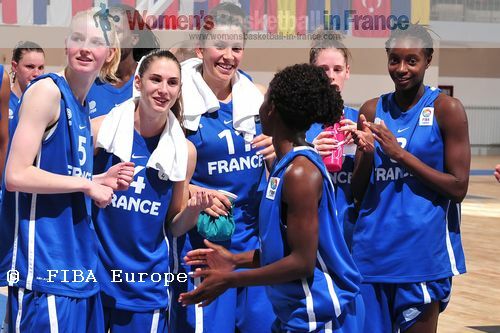 France beat Ukraine (90-48) and also won against Turkey (56-54). The match against the Netherlands did not take place. The team then travelled to Romania and completed their preparation with two games against Romania. France won both matches (67-36) and (58-41). The assistant coaches are Arnaud Brogniet and Fabien Frydryszak.